My Basque friend, Juan Luis, mentioned making pinchos morunos as an appetizer for a dinner party and for some reason, it rang a bell. I like to read Williams Sonoma’s Savoring Spain and Portugal and that’s where I had noticed the recipe. Of course, the Moors used lamb rather than pork for their pinchos. Because it was in the days before refrigeration, one way to make sure that meat did not spoil was to dress it with herbs and spices. Pinchos morunos are marinated in a mixture of spices and olive oil and then grilled or prepared “a la plancha” which is on a gridle. They have become popular tapas fare. In fact, I had an excellent serving of pinchos morunos at a tapas restaurant which recently opened in Orlando, Santiago’s Bodega. Besides making nice finger food, pinchos work well as a main dish. I served mine on a bed of yellow rice with green vegetables as sides. Juan Luis had mentioned using caraway seed in his marinade and I did not see that in the Savoring Spain and Portugal recipe, so I searched the Internet for Spanish blogs and comparing the marinades used I found that indeed, in Spain caraway seed is used consistently. So, in making my pinchos I went with the long list of spices I found in a very good Spanish blog recipe – the sole herb being dried oregano – and I carefully weighed everything in grams as per the instructions, but it was rather tedious as each spice had a different gram weight. The Spanish blog site had recommended using whole grain spices whenever possible and I did that, grinding them all to a powder using my old coffee grinder (highly recommend buying an inexpensive coffee grinder to grind spices and buy the whole spice and then toast and grind it yourself before using). But I am certain powderd spices would work just as well. Cut the pork tenderloin into 1″ chunks. Grind the spice mix to a fine powder (or use ground spices). Mix the pork chunks with the spice mixture, the olive oil, the onion and parsley and refrigerate overnight or up to 2 days. 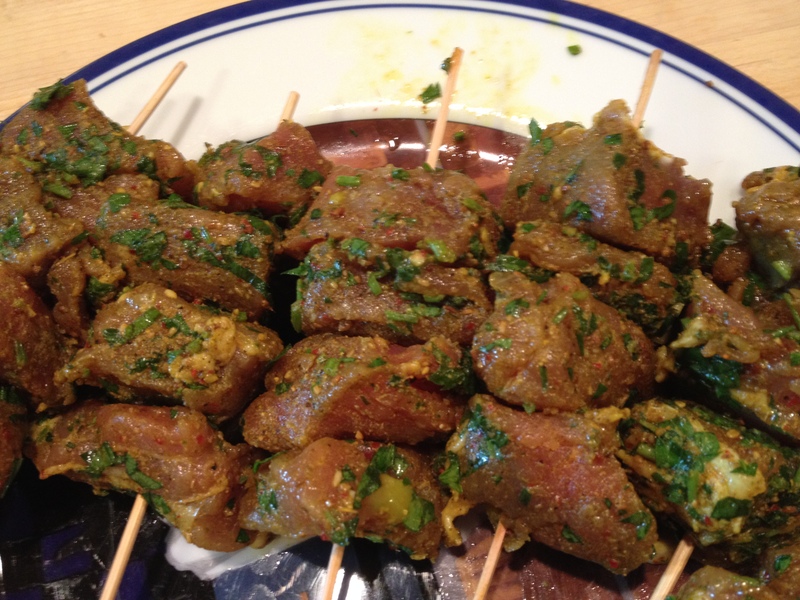 When ready to grill the pinchos, thread them 3-4 at a time onto wooden or metal skewers . Grill the pinchos for 3-4 minutes each side turning 2 or 3 times, depending on the grill. If using a gridle (plancha) since it does not flame, turn the pinchos 3 times, cooking them a little longer than if using a regular outdoor grill. Don’t waste the marinated onion/parsley mixture. There will be olive oil on the onions, so dump them onto a small skillet and cook them to serve with the pinchos. Grind all the ingredients and store in a jar. You will have enough for the pinchos and for use in soups and stews.